WHAT IS YOUR TURN AROUND TIME FOR CUSTOM MADE ITEMS? Our turnaround time for custom orders is between 2-3 weeks. HOW LONG WILL IT TAKE MY PREMADE ITEM ORDER TO BE SENT? Premade items will be shipped out within 3-5 business days. Postage time is in addition to this. Post times vary (depending on locations) but as a guide, most orders are usually delivered within 7 business days from post (within Australia). * Please note we do not have any control over Australia Post and are not responsible for any delivery delays. 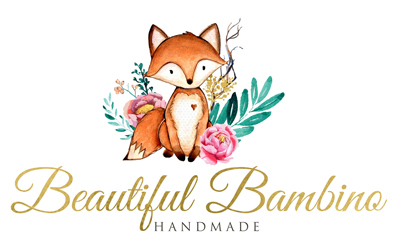 Beautiful Bambino does not accept liability for loss or damage to parcels once shipped. We strongly advise selecting the TRACKING option for your order. Please contact us if you have any queries regarding the shipping / delivery of your order. WHAT IS EXCHANGE AND WARRANTY POLICY? We do not accept returns or exchanges unless the item you purchased is defective. Warranty period is 30 days. Any signs of wear and tear or malicious damage will not be accepted for a replacement. All items are handmade and general wear and tear is expected given the nature of this item under the QLD fair trading act. All our items are handmade and therefore no two are identical. Each and every item is unique, unless stated otherwise. That being said, please note that the product you order will vary slightly from the one pictured online. You must ensure that the information you supply when submitting your order is correct. We cannot accept responsibility for non-delivery or offer any refund where you have given us inaccurate or incomplete information.